You can enjoy visual clarity and comfort at a whole new level with these toric contact lenses that operate by utilising unique PC technology. Ideal for those that frequently experience eye dryness, these contact lenses work by mimicking a substance that naturally arises in human cell membranes. Moisture is created by molecules binding and surrounding themselves with water. This results in a lens that is designed to combat any dry eye symptoms. Water molecules are attracted to the contact lenses, which are made from hydrogel, and are bound to the surface. The design assures that your eyes will receive high levels of oxygen throughout the day, which will stabilise vision and improve comfort. Your eyes can be catered for with these custom fit Proclear Tailor Made Toric contact lenses. 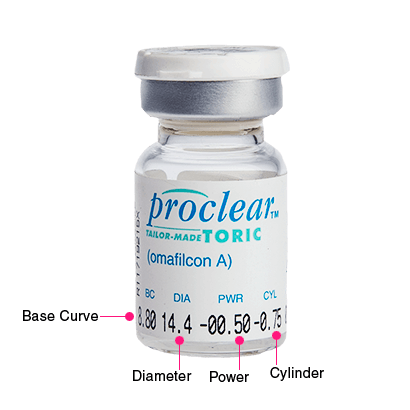 Proclear Tailor Made Toric lenses are to be replaced annually and we recommend seeking advice from your optician before wearing these lenses. For any further queries, please don’t hesitate to contact us at FeelGoodContacts.ie.